Using the Internet for God is written by Rob Cross. Rob has been a Christian for over 23 years. One of the most fun parts of Rob's life has been teaching Sunday School to grade schoolers at a Baptist Church for over 7 years. 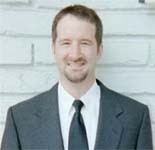 Rob has owned a successful Internet marketing company (TrafficProfits.com) in San Diego for over twelve years. 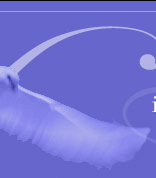 Rob sometimes works with Christian ministries helping them increase targeted traffic to their sites. Call Rob about your situation if you feel led. Rob sometimes volunteers his time to help with a Christian cause if he feels led and has time. If you know of a business that needs internet marketing help, referring them to TrafficProfits.com can get you a commission of $1000 if they sign a year contract, or $500 if they sign a 6 month contract. Rob was the lead Internet marketing consultant for approximately three years for one of the largest alternative investment firms in La Jolla, CA. He has also consulted for numerous other companies helping them find clients in market segments such as, luxury hotels, industrial products, hedge funds, cancer hospitals, and interior design. 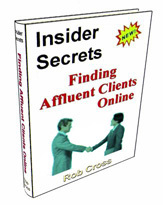 Rob is the author of the critically acclaimed book "Insider Secrets - Finding Affluent Clients Online"
Rob has spoken in different states to audiences about how to find customers online. Rob graduated with honors with a degree in computer science in 1987 from Southern Oregon State College. 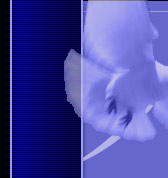 Before entering the internet marketing field, Rob was a computer programmer working in markets such as educational programming and public safety. Here are some sites Rob has recently helped get more traffic to by getting good rankings on Google.